Thomas R. Cutler is president and CEO of TR Cutler, Inc., Ft. Lauderdale, FL, (www.trcutlerinc.com) and writes frequently on the manufacturing sector. Information in the article describes part-nesting software from Optimation, Blue Springs, MO; tel.816/228-2100,www.optinest.com. The York, PA, operation of Johnson Controls, in replacing part-nesting software for its fabrication equipment, has realized significant material savings while ensuring that parts are produced in timely fashion. These software screenshots provide an example. 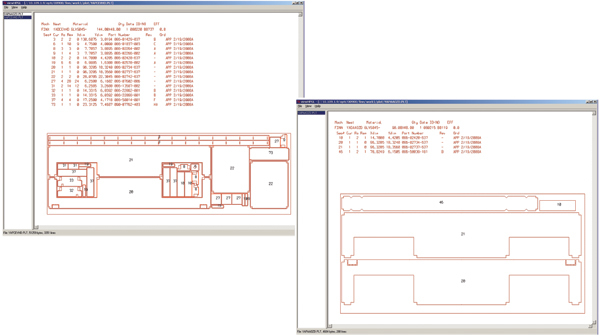 Note the improved part nesting (with more parts on the sheet) in the representation of the blank on the left, using the software’s nesting-optimization capabilities, as compared with that on the right. fabrication equipment from manufacturers such as Amada and Finn-Power. It boasts customers worldwide—for example, it was exclusively involved in climate-control projects for the 2008 Olympics in Beijing. Recently the facility was recognized for its commitment to efficiency and has been nominated for an ingenuity award. Because the facility only reuses about 25 percent of its part numbers, with the rest regenerated as needed based on size of equipment sold, its part-nesting solution for fabricating equipment must meet many requirements. In tackling that challenge as part of its effort to fully adopt lean manufacturing, JCI-York has added another feather in its efficiency cap. A major demand on lean manufacturing is control of first operations where raw material may be cut into multiple parts. First operations such as laser cutting or CNC punch pressing dictate what parts are available to subsequent operations, thereby controlling much of the downstream process flow. Building an optimal nest of parts requires the ability to read an active order file for the current demand of parts and extract the appropriate ready-to-nest parts. A host of factors must be considered, including material efficiency, part priorities (today’s orders, hot parts, filler parts), setup costs, order completion, labor and machine throughput. Key to building that optimal part nest is the right part-nesting software, which takes into account a host of factors when deciding the best to arrange parts on a sheet. That’s what Boyd Keller, a software engineer for JCI-York, was looking for four years ago when he found Axiom nesting software from Optimation, Blue Springs, MO. “The software used previously would not be able to handle the shear amount of work we needed to process,” Keller says. Axiom works by automatically responding to rapidly changing manufacturing priorities such as due date, order status and urgent need. Without increasing cycle time it can weigh a number of factors to determine the best nest, including labor, setup, schedule adherence, order cohesion, machine utilization, inventory and tooling requirements, according to Optimation officials. Each part within an order is nested based on schedule, ensuring that only the most critical parts will arrive at downstream operations on time, and real-time response ensures that a hot part is placed in the very next nest. The software allows manufacturers to input cost structures and manufacturing details that it will use to determine customized part nests. Though material-utilization tracking was not undertaken for the old software, Keller notes that for Axiom, in the past four years material utilization has risen from 77 to 82 percent; or, put another , $50,000 saved for every $1 million of raw material. Keller reported nesting efficiency that equates to approximately $80,000 in annual savings at the York location. And utilization continues to improve. “Axiom provided us with common line punching across dissimilar parts and automatic recognition of irregularly shaped windows in parts, without giving up the processing speed that we need,” says Keller. Keller also lauds the software’s ability to provide combinatorial shape nesting that selects the optimal mix of parts that meet complex constraints and manufacturing policies. Unlike true shape nesting, which only looks at one-half of the part at any time, combinatorial complete shape nesting visually considers the entire part shape and how it fits with other parts. It searches out opportunities to nests parts inside of parts to minimize scrap while ensuring execution of the production plan without unprofitable work-in-process inventory. The ability to learn is another attribute of the software.